It's been a long off-season comprised of lots of research and analysis. This upcoming weekend is one of the most popular weekends to conduct a fantasy football draft, so it's time to turn away from draft guides and start focusing on things like who to start and who to sit. I've changed my opinion a bit, but I'm extremely confident that certain players are going to excel this year. I present to you my MUST OWN players in redraft leagues. Their ADP's listed are PPR ADP's. Matt Stafford (120/10.09/QB14) - Matthew Stafford has finished as a QB1 (top-12) five out of the last six seasons. In other words, you're almost guaranteed a QB1 in the 10th round. Detroit was one of the luckiest teams in the league last year and are expected to regress, and it appears Stafford's ADP has taken a hit because of it. In addition, he rarely misses time, so it isn't necessary to have a backup when you draft Stafford. 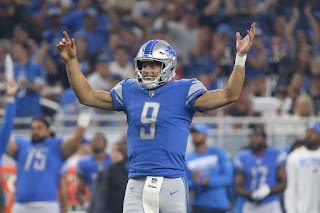 With a healthy Ameer Abdullah and rookie Kenny Golladay at his disposal, Stafford is the ideal guy to draft if you're really looking to wait on a quarterback. Christian McCaffrey (2.10/22/RB11) - Christian McCaffrey is going to win fantasy football championships this year, I'm certain of it. The talent he possesses is incredible. I've seen a lot of comparisons, from Brian Westbrook to Le'Veon Bell. I think McCaffrey is his own special talent. He has the hands of a wide receiver, but can run between the tackles without issue, as was seen this past Saturday on his TD run. He's a positive yardage machine and can do it all. He dominated at Stanford, he's dominating in camp and in preseason games. But for some reason, many people don't think he can produce once the season starts. With big-play upside, McCaffrey has been rostered on every single one of my teams this year and should be on yours as well. Stefon Diggs (5.07/57/WR27) - The only thing stopping Stefon Diggs from outperforming his current ADP is injuries, and even then he could still meet the WR27 spot. Adam Thielen was the WR27 last year, and Diggs is clearly more talented than Thielen is. We saw the flashes of an elite season from Diggs last year when he totaled at least 17 points in 5 of 13 games last year. He's also had an entire offseason to work with and build chemistry with Sam Bradford. Diggs's athleticism and target shares in 2016 have me "digging" the former Maryland star. Sammy Watkins (6.06/65/WR30) - This is absolutely ridiculous. So you're telling me that Sammy Watkins should drop 2 ENTIRE ROUNDS because he went from Tyrod Taylor to Jared Goff? Are you kidding me? People seem to be brainwashed by Tyrod's fantasy production and forget how he is not a very good pure passer. Goff was bad in 2016, yes, but he was Pro Football Focus's highest graded quarterback in preseason week 2. At most, the competition for targets in LA is equal to the competition in Buffalo, but I believe that LA's receivers are less talented than Buffalo's (excluding Watkins). Sammy has a WR2 floor with insane upside, and you MUST take advantage. Week 1-9, 2016, Zach Ertz was TE30. Zach Ertz (8.11/98/TE10) - Did you know that Zach Ertz was the TE1 OVERALL in the second half of last year? It's a stat that's being passed around often, but it's important to know it because of how impressive it is. Despite that, he's being pushed down draft boards because of the additions of Alshon Jeffery and Torrey Smith. However, with Jordan Matthews gone, it's being noted that Ertz will see even more work from the slot. This only improves Ertz's value which was already sky high.